The U.S. has recently begun preparation for the Clean Power Plan and its new emissions regulations. The goals set by the plan include cutting greenhouse-gas emissions in the country by 32% from 2005 levels by 2030. And clean energies will get a major boost from these targets. But what many people don't realize is that cleaner energy, including renewable power, was growing on its own pretty steadily even without the CPP. Each energy source is measured in British thermal units, a way to measure each distinct source on the same scale. As you can see, the use of renewable sources was growing even before the first draft of the CPP was released in 2014. The only stopper on that growth is the decline in hydropower use, due mainly to the massive droughts in California. However, it's clear that solar energy and wind energy especially will be driving future clean energy growth in the U.S. Solar energy is one of the most popular renewable energy sources in the public eye. Its small part of the U.S. energy portfolio comes from the cost of the solar cells and photovoltaic systems; solar is one of the most expensive forms of energy in the country. However, new innovations are dropping that price every day. In September, 2015, the U.S. Department of Energy announced that it would be investing $102 million into the solar sector. That amount has been divided into several projects aimed at increasing solar efficiency and reducing hardware costs. To do this, some of the funded projects will be working on software to better predict the lifetime and production rate of solar systems, while others will work to make the permit process for solar systems quicker and more affordable. What's more, solar systems are expanding into utility use. The solar market will still be dominated by residential, or distributed generation, systems for some time. 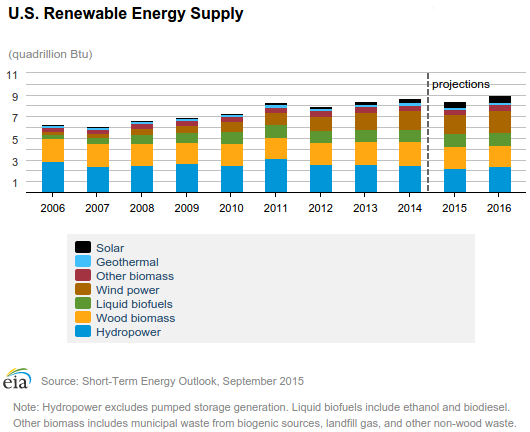 But the EIA expects that utility-scale solar will grow more than 100% between 2014 and 2016. By 2016, utility solar will provide an average of 0.8% of U.S. electricity. However, to keep this growth up, investors must keep investing. At the end of 2016, the solar investment tax credit will expire, meaning the 30% credit solar power systems have been receiving will disappear. This may stunt solar growth as fewer homes and utilities see solar as an affordable choice for energy. Companies that can stay cost-effective despite this change will be well worth investing in — as long as investors stay interested. And solar isn't the only renewable boasting organic growth. Wind, too, has seen some fantastic growth without the help of the CPP. As you saw in the chart above, wind already dwarfs solar in U.S. energy capacity. And it is still expected to grow in coming years. The EIA estimates that wind capacity will increase by 12% in 2015 and 13% in 2016 to reach a total increase of 18 gigawatts of capacity. As of March 2015, the Department of Energy reported that renewable energies accounted for about 13% of the U.S. energy portfolio, and that wind provided more than one-third of that amount. Like solar, wind has a government-approved investment tax credit. But, because there is more installed wind capacity and thus a higher standard, wind farms also have a production tax credit, which is based on the actual performance of the turbines once they're installed. Both of these have been extended for newly installed wind turbines. So long as they are online before the end of 2016, they will be eligible for the tax credits until 2018. What makes wind more versatile than solar is that the technology is not nearly as complicated. In solar panels, the proper mix of silicon and other components that make up the chemical reactions in the cell need to be adjusted to increase efficiency. With wind turbines, more power requires the turbine hub to be higher in the air and the turbine blades to be longer. Rather than chemical mixtures, better turbines just need sturdier materials. 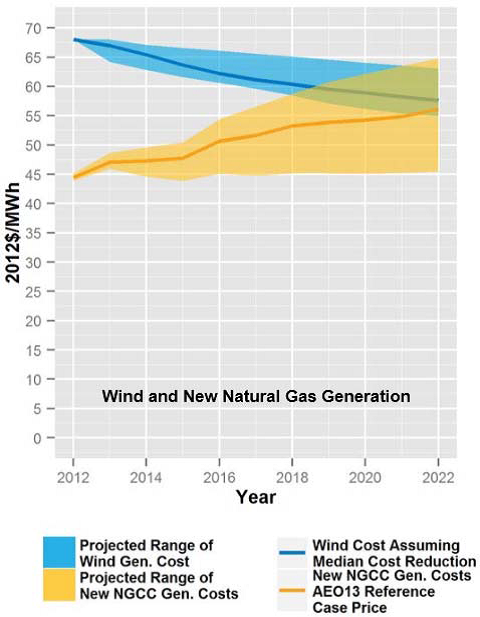 The white paper estimates that before the CPP's end goal of 2030, wind power could be even more affordable than natural gas. Much like with solar, however, investments will need to continue to keep the growth up. Before we can ramp up solar and wind enough to power the energy-hungry U.S., the technology and hardware need time to improve a bit more. But with the CPP looming, progress must continue to be made in the direction of emissions cuts. Natural gas has been heralded as the fuel of choice for transitioning away from dirty coal power and into sustainable clean power. With a fraction of the emissions of conventional coal power plants, natural gas plants are cropping up all over the country. Some companies have opted to shut down coal plants and turn them into natural gas combined cycle plants, which not only run on cleaner natural gas, but also use the residual heat from the energy production to create steam for more energy. And the U.S. has this commodity in abundance. The shale boom, which began around 2008, not only supplied the country with a glut of oil, but also mass amounts of natural gas. From a market perspective, it seems like there may not be a way to invest in the growth of natural gas. As a fossil fuel, it's being used as just a transition into even cleaner energy sources. However, its abundance and low price make it a fantastic investment. Once the glut of natural gas eases, prices will return. Producers will then be more inclined to increase production again, and profit will follow. And the final, unforgettable point about renewable sources: none are constant. There will always be rainy days and windless days to make solar and wind power intermittent. Natural gas will then continue to be the dispatchable fuel of choice for covering energy demand when renewables are offline. All of these energy sources need investors, and those who invest now are sure to profit as each grows. There are several solar companies on the market today that still have great potential growth. First Solar (NASDAQ: FSLR) is a great bet on a conservative company. Rather than diversifying its assets, First Solar is focusing on its solar PV technology. The advancements in the company's technology have raised efficiency and dropped the price of its solar panels. The company also offers solar system solutions, or construction, maintenance, and operation assistance to both residential and utility-scale consumers. First Solar represents the kind of innovation and focus the solar market will need in coming years. Wind energy investments can be a little more diversified. For instance, Duke Energy (NYSE: DUK), one of the U.S.'s largest energy companies, has a wind division and the funds to keep expanding upon it. The company acquired Tierra Energy in 2007, an acquisition that added 1,000 megawatts of wind capacity to its assets. Duke now owns and operates 15 wind farms and has a 50% stake in the Sweetwater project, one of the country's largest wind farms. ExxonMobil (NYSE: XOM) is the way to go for natural gas. The company owns the world's largest reserves of natural gas and is the 4th largest oil and gas company in the world based on production. Based on largest annual revenue, it is #1. As more dirty coal power is phased out, more natural gas will be needed to pick up the slack. ExxonMobil has the supply to meet that coming demand. Every one of these sectors will need investment in the next few years — even long-standing natural gas. Technological innovations are being made every day to make energy production cleaner, more efficient, and more cost-effective than ever. And there is still plenty of room for improvement. Invest now with any one of these booming energy sources while there's still time for growth, or miss out on the opportunity to profit on it.